This is the best dessert soup I ever tasted. I love it! However, it is quite expensive to buy from outside stores. I know a regular bowl of premium white fungus with rock sugar dessert soup costs $3 – $5. Moreover, those ‘commercial’ desserts are normally way too sweet for the palate. Hence, I decided to cook it at home whenever I feel like having some. 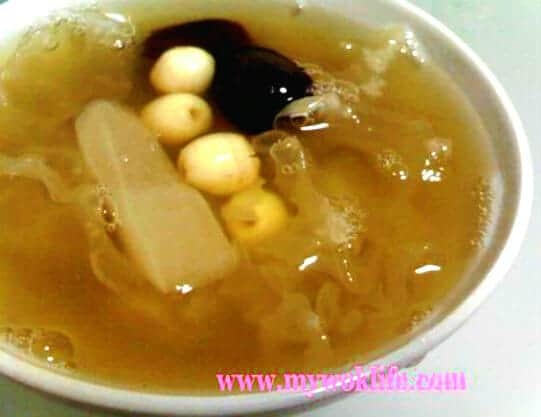 I can adjust the sweetness to my liking as well as adding my preference of ingredients which complement the white fungus dessert. Making process of this dessert might look complicated, but indeed, the cooking steps are far easier than what you thought. The most common way of handling the white fungus is to pre-soak it for at least an hour, and then add it only towards the end of boiling. However, I prefer to soak it for no more than 10 min, but to add it in and boil together with the rest of the ingredients, from the beginning. The texture of white fungus will turn out even better. Chewy, but very tender, its jelly-like consistency almost melt in your mouth. 1. Soak white fungus in clean water for 10 min, or until expanded. Cut off stub, rinse, and cut to small pieces. Briefly wash red dates and lotus seeds separately. 2) Bring a pot of water to a boil over high heat. Add white fungus, lotus seeds, red dates, candied winter melon and rock sugar into boiling water. 3) Bring it to a boil again. Reduce heat to low fire, simmer for 30 min. Add in small sago, and simmer till all ingredients are tender and soup becomes lightly thicken, for another 30 min. Serve hot, or chilled. As you can see, it is way too simple to have this tasty, healthy and hearty premium dessert soup made by your own at home. A bowl of such dessert not just satisfies your taste bud, it’s also a reward to your skin and body. It helps to nourish your skin and complexion as well as promoting better health of your body. That’s why dessert soup has been so popular in the Cantonese society. No particular reason for adding candied winter melon, it’s my preference as I like its crunchy and chewy bites when having this dessert. A bowl of this sweet soup counts 250kcal. Tips: Do not add too many red date as its taste will over-whelm the rest. * Use mini-sized sago for easily cooked. If choose big sago, pre-boil for 1 hour. * If you are getting dried uncooked lotus seeds, pre-soak them for at least 3 hours. 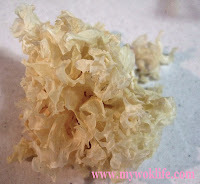 * Choose better quality type of white fungus. Its colour should be pale and off-white. That’s one of the Chinese dessert we used to have in winter for dry weather. 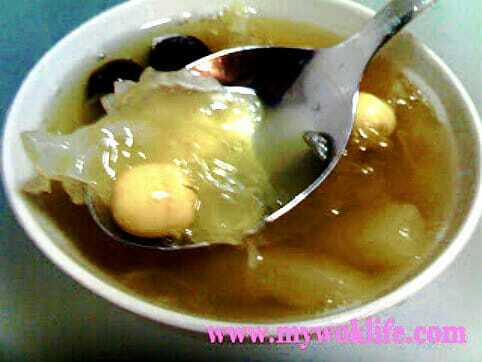 White/snow fungus is good for sweetened soup and black fungus is great for dishes, both are good and healty ! Thanks for the recipe. I made a pot if a simikar kind if soup and I would like to know how long can I keep this in the fridge? Hi! It’s best to consume all within the day, as it’s not advisable to keep fungus good overnight or kept too long. However, I do keep in fridge and consume again within next 2-3 days, at times.